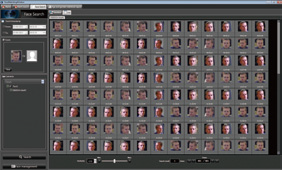 Simple batch registration of a maximum of 10,000 faces is possible with the standard Facial Recognition Server Software (WV-ASF950). The optional Face Registration Expansion Kit (WV-ASFE951W) enables registration of up to 30,000.
system will then display the relevant information in an accessible manner. One of the major advantages of the Facial Recognition Solution is the level of control it gives you from a central point of management. Thanks to the direct connection between camera and server, you can control and gather insight from up to 20 remote cameras from one server, at the same time. 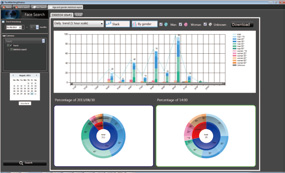 With face matching and visual analysis carried out by the system in real time, your operator can easily access any recorded images related to that face or customer, via the GUI in their monitoring software. 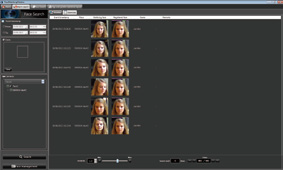 Panasonic's face recognition server, WV-ASF950, offers the possibility to run facial recognition in an IP Security System.